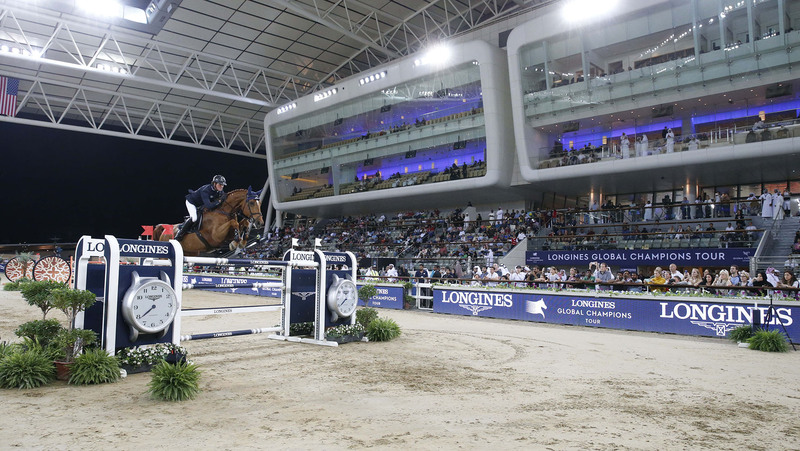 Unstoppable and untouchable Ben Maher (GBR) crowned a season of a lifetime winning the LGCT Grand Prix final in Doha on the superstar young stallion Explosion W and was crowned the new 2018 Champion of Champions. Riding the crest of a wave the British rider was also the main anchor of the dominant London Knights who won the final of the GCL team championship on the same day. He will be the one to watch at the new €12 million GC Playoffs in Prague in December where he will compete in the LGCT Super Grand Prix and the GCL Super Cup. Her Highness Sheikha Mozah bint Nasser presented the winning medal and His Excellency Sheikh Joaan Bin Hamad Al Thani was also in attendance as the British national anthem rang out across the vast floodlit arena of AL SHAQAB in Doha. There were amazing scenes as The Father Emir of Qatar Hamad Bin Khalifa Al Thani, who had the vision to create the magnificent AL SHAQAB equestrian faciilty, toured the arena where families had enjoyed a programme of top-level sport. Last year’s winner Bassem Hassan Mohammed (QAT) had the unenviable task of going first with Gunder - the hopes of local spectators resting on his shoulders. But it wasn’t to be their day, as the duo took out three fences and went out of contention. There was plenty early drama, the Longines treble claiming a few victims including Piergiorgio Bucci (ITA) and Driandria who had a last minute stop at the final element. A retirement from Leopold van Asten (NED) and VDL Groep Beauty and Scott Brash (GBR) and Hello Shelby would prove that Vezzani’s course another serious test. To Lorenzo’s delight he learned he had won the last coveted place in the LGCT Super Grand Prix at the Playoffs in Prague next month. The 2018 season now finishes, but all eyes will be on the GC Playoffs in Prague, taking place from Decemeber 13th - 16th at the O2 Arena. Ali Al Rumaihi, Event Director of AL SHAQAB: "The AL SHAQAB team has put in a lot of effort in making sure that the event goes according to plan. It took months of planning and coordination among many departments in AL SHAQAB as well as the LGCT team to make it run smoothly. I am very proud of our achievements and I would like to personally thank each and every team member who have contributed towards the success of this event." Jan Tops, Longines Global Champions Tour Founder and President: “Everyone [in Qatar] is very supportive, the Royal Family, the Qatar Foundation, AL SHAQAB, and it has been amazing to be able to ride in this stadium. It is unique for our sport, you don’t see it anywhere else in the world. The conditions are fantastic, the footing, the stabling, flying horses here, - we take it for granted and I respect very much the relationship we have and will continue to build on. "The second place after Ben [in the Championship] was still open, I think there was six or seven riders with the possibility to take the podium. Harrie had a great day today coming back to the 2nd place. This season I think everybody was really focused on the podium and we have three amazing riders there. You can only be in the podium if you have been very consistent the whole year and I think these are all champion riders and they are trying their best all the time." Nicola Philippaerts, 3rd place: "I think this season has been amazing - I was fortunate to have two really good horses to compete in the Tour and it just worked out well. I think it’s very hard to win already one LGCT Grand Prix in the Global Champions Tour and I was fortunate to, so I think I’m honoured to win two. These are the best shows in the world and hopefully I can be back next year. "I think we had a great [GCL] team and for sure if you want to try to be as best as possible for the team, you go to the Grand Prix and you do as good as possible there as well and everything worked out this year. We are a good team and good horses and hopefully we can have a good year again next year. Harrie Smolders, 2nd place: "I’m very pleased with my two horses and they went great again this year - they performed very well and I think this year it was not only enough to jump clear rounds - you see Ben, he won four Grand Prix so its not only about going clear its also about being really fast. I think that’s a big achievement even when we focused the whole season on the Global this year - but Ben was out of our league. Of course, you are a sportsman and I think we had a similar season that we had last year and again my horses were very good, but he was just better." Ben Maher, 2018 LGCT Champion: “I’ve been lucky to have many great horses in my career so far, and I’ve been doing the Longines Global Champions Tour for many years now but have never been in a position to contend for the Championship. I don’t know if I’ll have another season like this - I did nothing different this year, but fortunately for me everything went right and I had a great team of horses. But it’s also to my team around me, they get us here every week - there’s a lot of people to thank behind the scenes. Explosion has been in our programme for a while but Shanghai was my first big show on him. We had quite a surprise result there and then built on that. The horses give you such confidence, but I think many riders in today’s course changed their mind - I think I even asked Harrie at one point what his thoughts were! I trust Explosion, and that’s the difference - the quality of horse that he is and the luck I’m having at the moment.